Hastings United Football Club has sought to bolster its play-off bid by signing two Brighton & Hove Albion youngsters on loan. Albion under-21 goalkeeper Harry Doherty will take over between the posts for the next 28 days, with the 19-year-old having agreed a loan move to The Pilot Field yesterday (Monday). Doherty is set to become the seventh different player to don the goalkeeping gloves for the U’s this season because Harry Girling has been recalled from his loan at United by parent club Millwall. Girling had agreed a four-week extension to his initial 28-day loan last week, but has subsequently been called back by Millwall, although the Lions did allow him to play in Saturday’s victory at home to Tooting & Mitcham United, when he kept his second clean sheet in five appearances. 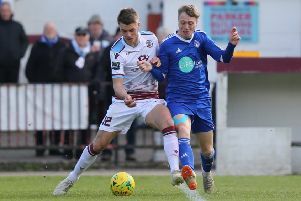 Irish player Doherty joined the Seagulls in the summer of 2014 after starting his junior career with Charlton Athletic and is set to be joined at United by 20-year-old team-mate Robin Deen. The midfielder has also been at the Amex Stadium since 2014 and spent a month on loan at Ryman League Premier Division side Lewes earlier this season. Both new signings are expected to be part of the United squad which is due to visit Three Bridges tonight, kick-off 7.45pm. The club would like to place on record its thanks to Brighton & Hove Albion for sanctioning these two loan deals and to Millwall for allowing Girling to join the U’s last month. For the record, the goalkeepers used by United this season are Matt Cruttwell (4 appearances, 2 clean sheets), Girling (5, 2), Josh Pelling (33, 8), Dan Rose (1, 0), Joe Taylor (1, 0) and outfield player Sam Adams, who took over the gloves after Pelling was injured in the 1-1 draw at Chipstead during December. This term’s total is still one short of the 2012/13 campaign when eight goalkeepers were used. They were Matt Armstrong-Ford (24 appearances, 3 clean sheets), Cruttwell (2, 0), Daniel East (21, 6), George Howard (5, 0), Liam O’Brien (5, 0), Daniyar Tashpulatov (1, 0), Joe Winchester (3, 1) and Adams, who again stepped in as emergency cover against Lewes. Thanks to Sean Adams for supplying the statistics.